I’m already following in my grandmother’s path, copying recipes that catch my eye. But instead of pen and paper, I’m using my iPhone. I’ll simply snap a picture of the recipe and then zoom in when I’m ready to cook. My mom’s texted me her favorite banana recipe, and I’ve snapped a copy of her Cosmopolitan proportions. The weekend we made focaccia together, I flipped through her books to find a good vegetable sandwich using the flavorful flat bread, that would be different than the standard raw vegetable sandwich. This simple sandwich from Vegetarian Cooking for Everyone hit the spot, making a great lunch with my leftover bread. Adapted from Deborah Madison’s Vegetarian Cooking for Everyone. This recipe is easily adapted. I didn’t have a tomato, but a nice, ripe slice would surely be good. Slices of avocado would also be delicious. My focaccia was already topped with garlic oil, so I didn’t rub a clove on the toasted bread as the recipe had called for–but I did use my favorite roasted garlic goat cheese from a local farmer. Mmm. Heat a little oil with the garlic in a skillet over medium-high heat until the garlic begins to color, then add the spinach and sprinkle with salt, pepper and a few red pepper flakes. Saute a few minutes until wilted and tender. Drain in a colander or on a paper towel. Discard any juices left in the pan, and add a little more oil with the onion. Saute over medium-high heat until golden, abou 5 minutes. Toast or broil the focaccia, and rub halves with the garlic clove, if desired. Pile the spinach on the bottom halves of the focaccia, then top with the onion and tomato. Spread goat cheese on the other half; broil the halves if desired. Sprinkle with vinegar, add the top and press down to secure. Enjoy! This looks delicious. 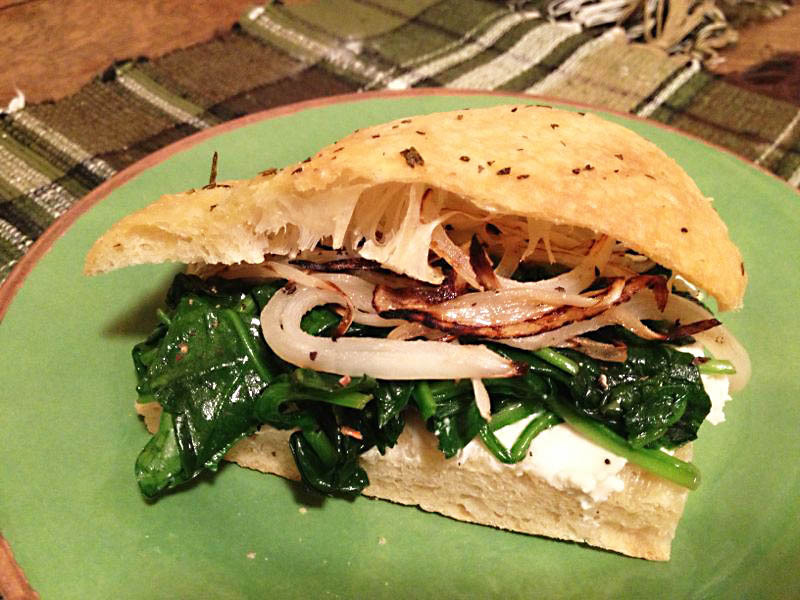 I love spinach and focaccia makes such great sandwiches! I really liked the difference in flavor and texture that the cooked spinach brought. Raw spinach can get so boring on sandwiches!